We could see a storm brewing by mid afternoon. That's pretty common here in North Carolina. After a hot muggy day, we often get rain and thunderstorms. Our Weber Smokey Joe grill is perfect for such days. It's small and fits on the porch without a problem. We also take the Smokey Joe on the road for tailgating and concerts. Very handy little second grill. 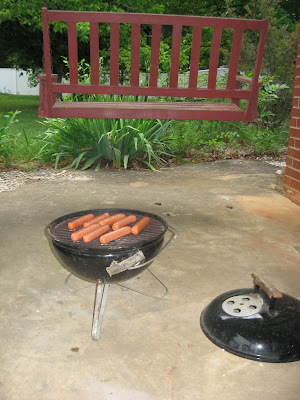 I had some hot dogs and buns, so I fired up the charcoal. Hot dogs are already cooked, so they just need to be heated. We could do that in a pan on the stove or in a microwave, but they taste much better with that smoke flavor. And, they look tastier with the grill marks. I put the whole pack on. 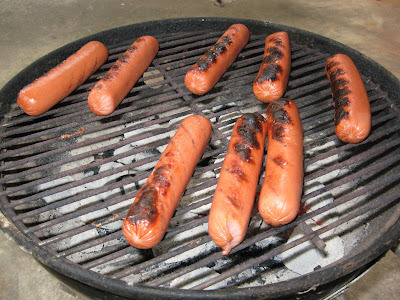 Grilled hot dogs are delicous warmed over. The boys like to grab hot dogs out of the refrigerator after a cook out. They just stick them in the buns and heat for about 20 seconds. Instant lunch or snack - and that great grilled flavor for a second day.